Abergeldie Castle, Aberdeenshire, Scotland, 1900. The castle is about two miles from the royal familys country home at Balmoral. Its earliest parts date from the sixteenth century. 10x8 Photograph (25x20cm) Abergeldie Castle, Aberdeenshire, Scotland, 1900. by Heritage-Images . 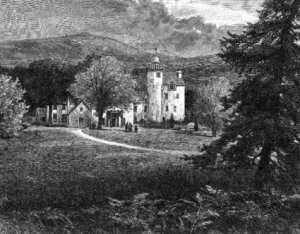 The earliest parts of Abergeldie Castle, which stands barely two miles from the royal family’s country home at Balmoral, date from the sixteenth century The castle has had its fair share of visiting guests over the years, including royalty. It also has an extra, uninvited ‘guest’, known as French Kate or Kitty Rankie. She was apparently a French woman who was employed in the castle at one time. The unfortunate soul was suspected of practising black magic and was arrested and charged with witchcraft. She was confined in the castle until found guilty Then she was taken to a neighbouring hill, tied to a stake and burnt for her crimes. Her angry spirit returned to the castle after her death. 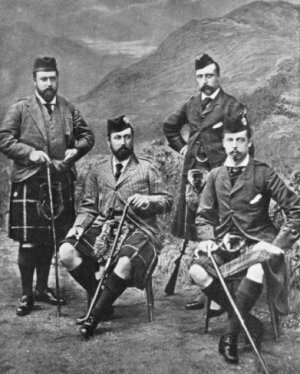 Queen Victorias four sons at Abergeldie, 1881. The princes in Scottish dress The Prince of Wales (future King Edward VII); Prince Albert, Duke of Edinburgh; Prince Arthur, Duke of Connaught; Prince Leopold, Duke of Albany. Duke of Connaught. 10x8 Photograph (25x20cm) Queen Victorias four sons at Abergeldie, 1881. by Heritage-Images .